Pilot, Maurice Francis Graham, took off from Las Vegas carrying US mail. He arrived over Cedar City, but could not land because of a snowstorm. He crash landed in Washington County, but his plane was not found until June 24th and his body was not recovered until July 17. The two persons on board were both killed: Paul Neilson (24, the pilot) and Antone J. "Junior" Neilson (23). For an eyewitness account and newspaper clippings, click here. A teenage spectator, Dolores Woodbury, was killed at the Wilson-King Sky Show at the St. George Municipal Airport. Mrs. Joe White and her infant daughter were were also injured, when a light plane involved with the airshow experienced brake failure on landing and crashed into cars parked at the edge of the airfield. The pilot, Bernadine Lewis King, was also injured.
" Plane Hits Cars, Kills Girl", The Deseret News, June 23, 1947"
This accident didn't take place in Washington County, but it involved two popular St. George residents and caused quite a stir locally. Herman and Conrad Larkin crashed in a snowstorm just north of Delta UT and were fatally injured. The Larkin brothers worked together running their own heating & plumbing business and were known as "The Singing Plumbers". Dr. Frank Y. Gates, 32, of Las Vegas, was en route to Salt Lake City to deliver Christmas presents to his two children, who live there with their mother, Dr. Gates' former wife. 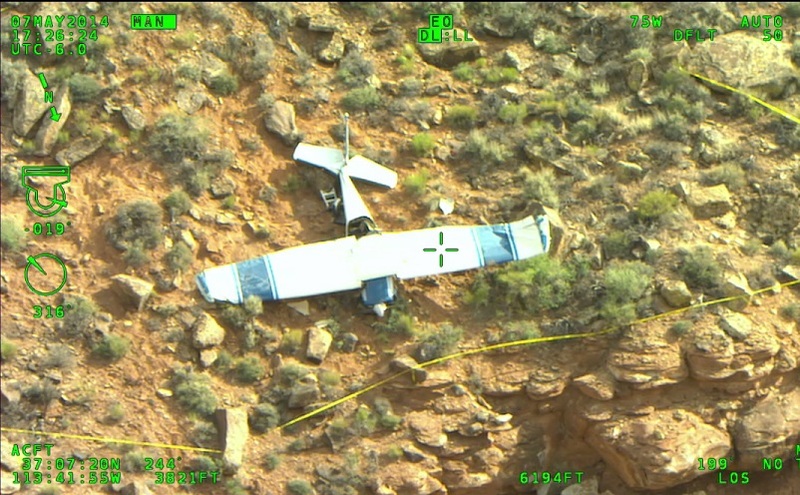 Crashed near Jackson Peak in the Beaver mountain area 30 miles northwest of St. George. The pilot was the only one on board and he was killed. For a collection of AP news articles, " click here"
The crash occured on Square Top Mountain, about 20 miles northwest of St. George. The plane impacted at an elevation of about 6,300 feet, at least 1,200 feet below the mountaintop. The huge, eight-engine bomber slammed into the mountain as it approached the Nellis Air Force Base bombing range in bad weather. The plane stationed at Robins Air Force Base GA. It was taking part in Red Flag - mock war games conducted several times a year over the Nevada desert. It carried no weapons of any kind when it crashed. See Loren Webb's 4/12/2013 article on KCSG.com. SkyWest Airlinest was flying Dana Henderson, a special projects editor for Air Transport World, into St. George to do an article on SkyWest's expanded commuter services. Two SkyWest officals were waiting for them at the airport when pilot, Neil Brown, made an almost perfect landing, except for forgetting to put the landing gear down. There were no injuries. The plane sustained about $50,000 in damages. See Loren Webb's 9/15/2012 article on KCSG.com. The plane was substantially damaged during a forced landing but the pilot received only minor injuries and there was noone else on board. The plane lost power and the pilot tried to make it to the old St. George Airport. It clipped a power line and crashed into the side of the mesa between the runway and Bluff Street, just west of Tablernacle Street. 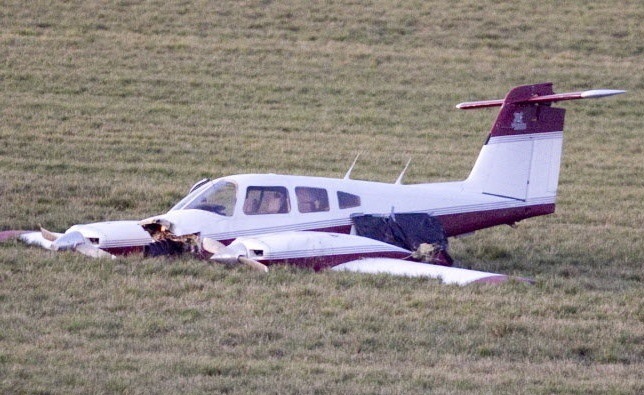 The pilot, a retired FAA aviation safety inspector, died in the crash. This air tanker crashed northwest of St. George after dropping fire retardant. The pilot was killed. The plane was en route from Las Vegas NV to Cedar City UT. The pilot, Gary Logan (54) of Las Vegas, was the only one aboard and he was killed. The plane took off from the new St. George Airport in the early hours of the morning with four young men on board. It crashed shortly after takeoff, but wasn't discovered for several hours until a 6:00 am security patrol. The victims were Christopher Jordan Chapman (20) and Colby Chester Hafen (28) both of Santa Clara; Tanner James Holt (23, pilot) of Washington City and Georgia; and Alexander James Metzger (22) of St. George. The FAA determined that the aircraft exceeded its maximum gross weight by about 160 pounds. The pilot and two of the passengers had consumed multiple alcoholic beverages at a party on the night before the flight and alcohol was likely a contributing factor. 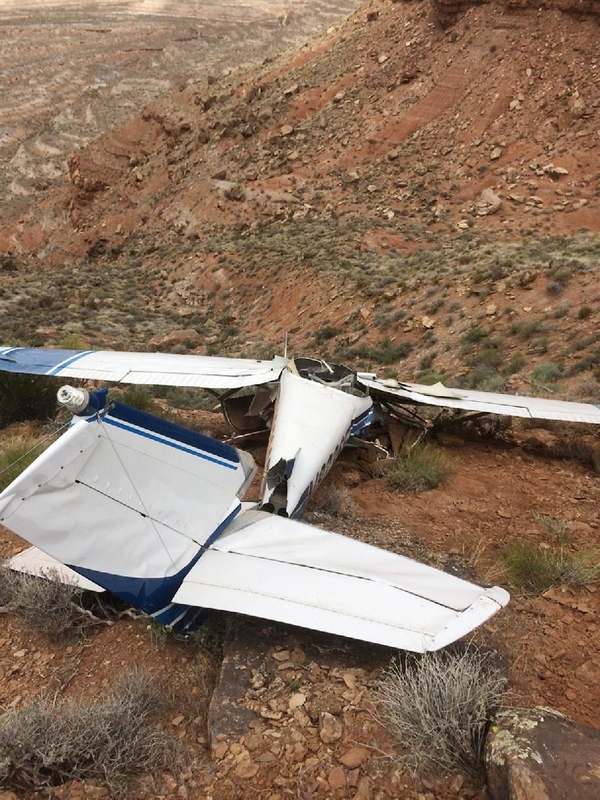 A private plane crashed into Frog Hollow Wash southeast of the Hurricane Airport. The pilot, USAF Major (retired) John Spey (74) of Apple Valley was seriously injured. This 2-seat trainer crashed while on a training flight over rugged terrain in the Santa Clara River Reserve just south of Santa Clara. 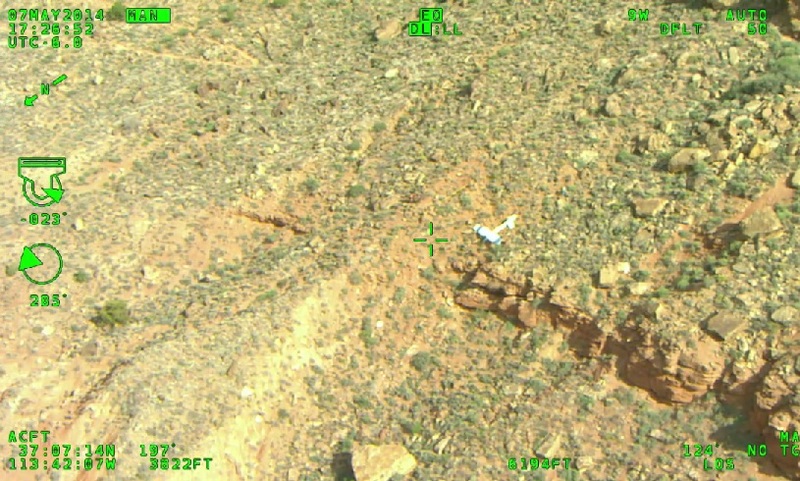 The crash occured at 11:09 am near the Barrel Roll and Side Winder trails in the Cove Fort Wash, approximately one mile south of the Jacob Hamblin Home. The instructor, Gary Hawes (75) of St. George, and student, Brad Brian (38) of Washington, were killed. Hawes was a former U-2 pilot during the Vietnam War and later a Skywest pilot. Dr. Brian was an anesthesiologist at Dixie Regional Medical Center. Articles in The Spectrum on 5/7/2014 and on 5/8/2014. The pilot made an emergency landing in a field off of 920 West in Hurricane due to an electrical fire. The pilot and five passengers got out safely. Two of the passengers were transported to the hospital with non-life threatening injuries.